C23 The sensor voltage should be the following for 2 sec. And more, after ignition switch is turned on. To sensor circuit open or short. To sensor circuit is open or shorted to ground or vcc circuit open. P1651 H Sensor voltage is higher than specified value. Remove the ap sensor from the bracket. 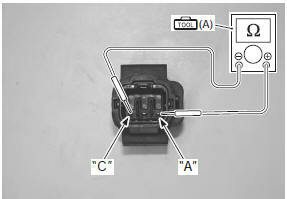 Check the to sensor coupler (1) for loose or poor contacts. If ok, then measure the to sensor resistance. Measure the resistance between terminal “a” and terminal “c”. Is the resistance ok? Go to step 2. Replace the to sensor with a new one. 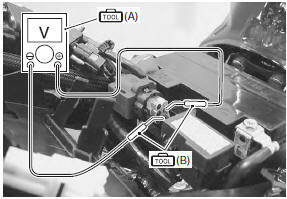 Refer to “to sensor removal and installation” in section 1c (page 1c- 6). If ok, then check the to sensor lead wire continuity. 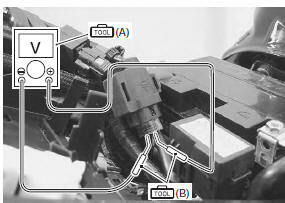 Disconnect the to sensor coupler. Check the continuity between the r wire and b wire. If the sound is not heard from the tester, the circuit condition is ok. Check the continuity between the b wire and terminal “31”. Also, check the continuity between b/br wire and terminal “35”. Is the continuity ok? Go to step 2. B wire shorted to vcc, or b/br wire open. Check the continuity between the b wire and ground. Also, check the continuity between the b wire and b/br wire. If the sound is not heard from the tester, the circuit condition is ok. Check the continuity between the r wire and terminal “7”. Also, then check the continuity between b wire and terminal “31”. Is the continuity ok? Go to step 2. R or b wire open, or b wire shorted to ground. 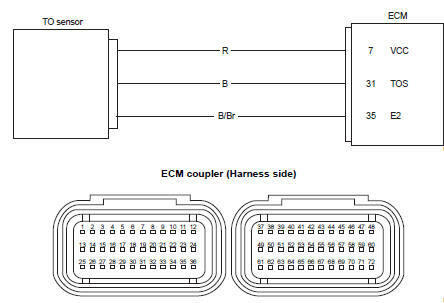 Connect the ecm coupler and to sensor coupler. Measure the voltage at the wire side coupler between b wire and b/br wire. Dismount the to sensor from its bracket and measure the voltage when it is leaned 65° and more, left and right, from the horizontal level. 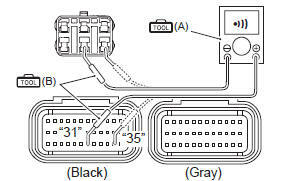 R, b or b/br wire open or shorted to ground, or poor “7”, “31” or “35” connection. Loosen or poor contacts on the ecm coupler. Replace the to sensor with a new one. 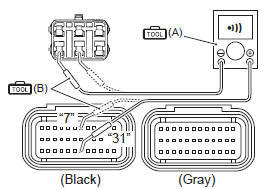 Refer to “to sensor removal and installation” in section 1c . refer to “no spark or poor spark” in section 1h for details.